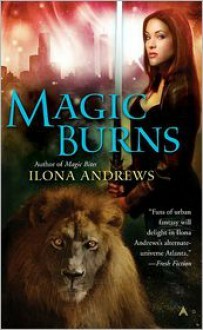 In the second book in the Kate Daniels series, Atlanta is threatened by a magic tsunami: monsters rise, magic runs deep, and a little girl is hunted by demons.Ilona Andrews is the pseudonym for a husband-and-wife writing team. Ilona Gordon is a native-born Russian, and Andrew Gordon is a former communications sergeant in the U.S. Army. They met in college, in English Composition 101. Gordon and Ilona currently reside in Georgia with their two children and two dogs, and are currently working on Kate Daniels's next adventure. Renee Raudman is a multi-award-winning audiobook narrator. A multiple Audie Award nominee, she has earned a number of AudioFile Earphones Awards, including for The Last Secret by Mary McGarry Morris and Wesley the Owl by Stacey O'Brien, as well as a Publishers Weekly Listen-Up Award for Joe Schreiber's Chasing the Dead. She has also performed on film, TV, radio, and stage, including the recurring roles of Jordon on ABC's One Life To Live, Phyllis on NBC's Passions, and guest-starring roles on prime-time TV. She has been heard in cartoons (The Simpsons, Billy & Mandy), videogames, and on the E! channel. Her narration of Homer's Odyssey by Gwen Cooper was selected by Library Journal as one of the best audiobooks of 2009, and her reading of Marthe Jocelyn's Would You was selected by the ALA as one of the best young adult audiobooks of 2009.
http://pagefault.booklikes.com bookaneer 3.5 "Nothing kills a party like an oversize metal hedgehog." text "Nothing kills a party like an oversize metal hedgehog." It was good, some parts where "meh" but the ending was really, really good. I kind of hated on Curran in the first book big time and wished she would get a different love interest but I might warm up to him.